You have a large investment in your home and potentially the landscaping surrounding it. The next step to optimize your enjoyment is to have Outdoor Lighting installed. 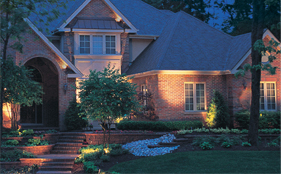 Outdoor Lighting adds beauty to your home and allows you to enjoy your landscape in the evening hours. It also provides safety and security for your Atlanta home. Hutcheson Horticultural has the experience to design and install an outdoor lighting system that can turn your beautifully landscaped home in to a spectacular showplace at night. This is not an exercise in mounting floodlights at key places in your yard. We design a complete system utilizing start of the art long lasting LED lights and create lighting effects that highlight the best features of your home and landscaping. We can feature your colorful annuals, dramatic trees, and interesting architectural elements of your home. Or hire Hutcheson Horticulture to take it to the next level and have us design and install lighted fountains and waterfalls for the ultimate backyard environment. At Hutcheson Horticultural we offer many specialties in addition to our lawn maintenance programs, but our expertise comes in taking all these different elements and combining them to create total and unique outdoor environments that reflect your lifestyle. We create patios, decks, outdoor kitchens, waterfall, exterior fireplaces and even pools and spas. We are the source in Atlanta to handle all of your landscaping design and installation needs. No matter what your landscaping needs involve, from lawn maintenance to seasonal color or outdoor lighting, Hutcheson Horticultural is prepared to work to provide you with a beautiful solution. For more information call us at 770-924-1001 or use the “Contact Us” feature on our website.